I enjoy Middle Eastern food, but have limited experience in preparing it. My repertoire to date has been limited to hummus, stuffed grape leaves, lamb kofta, fattoush salad, pita bread (minus the pumpkin porter experiment), tabouli, couscous and more: all simple items that only hint at the depth of flavors traditional to so much Middle Eastern fare. It's definitely time to expand my cooking horizons, so why not start with a favorite street vendor item, Shawarma. Every visit to the Pier Street Sunday Market in Campbell River, B.C. includes a visit to the Baba Gannouj food cart for a beef shawarma pita half. 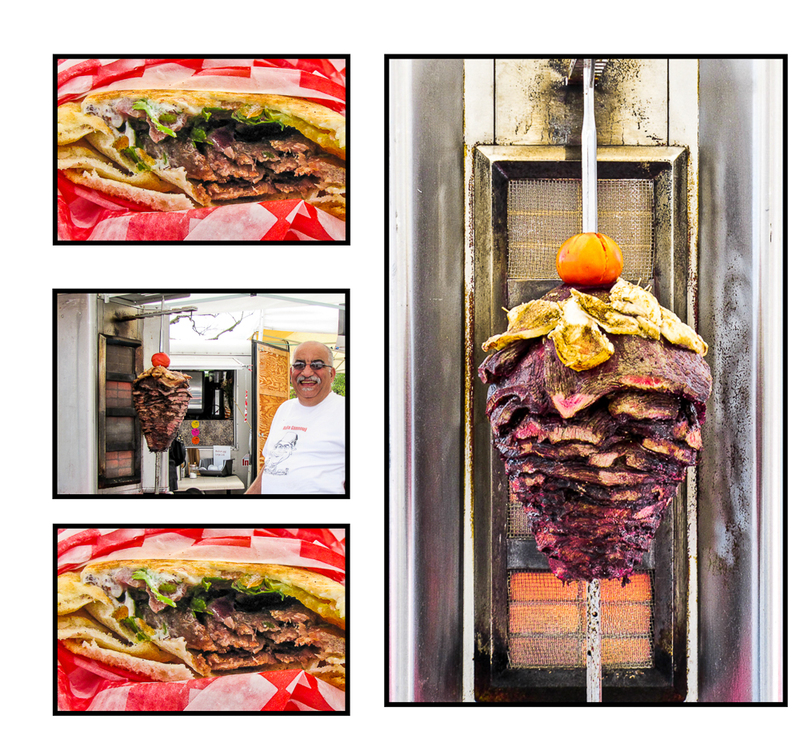 That sandwich filled with shaved, marinated and roasted meat is Delicious with a capital D.
Photo: Food cart Beef Shawarma at Pier Street Sunday Market in Campbell River, B.C. Lacking a vertical rotisserie, I needed another approach and found two terrific resources. Faith Gorsky's cookbook and blog "An Edible Mosaic", and a recent Cooking:NYT post encouraged me to try Chicken Shawarma in the Oven. Good decision! the meat was well-flavored and delicious as an entree on day one, reheated well for lunch on day two, and on day three made an amazing shredded chicken pita filling. It was a simple, quick process, though overnight marination was the key to well-flavored chicken thighs. A large ziploc bag made easy work of mixing the marinade and it stored easily in my always-packed fridge. 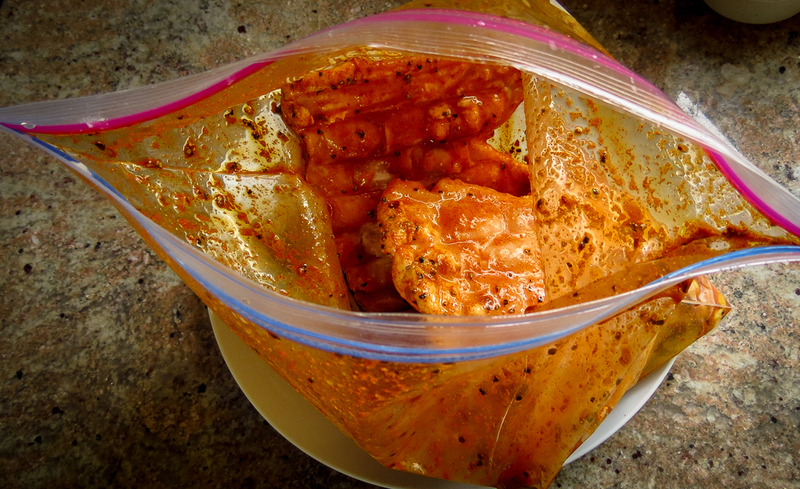 Note to self: Remember to turn the bag several times to redistribute this messy, colorful marinade. Just before cooking, toss in the onion quarters to coat. Use kitchen tongs to avoid staining your fingers and arrange the thighs and onions in a single layer on a foil-lined sheet pan. Roast in the preheated oven until the chicken is no longer pink in the middle, turning occasionally. Optional finish: saute quickly in a tablepoon of oil in a hot skillet on the stovetop to further crisp up the edges. Slice. Serve with an assorted accompaniments. Enjoy! This is Middle Eastern street food that translates well into kitchen fare... though I'll still order it whenever I visit the Baba Gannouj food truck. Add the chicken and coat well. Cover and store in refrigerator for at least 1 hour and up to 12 hours. Heat oven to 425 degrees. Use the remaining tablespoon of olive oil to grease a rimmed sheet pan (OR line the pan with aluminum foil for easy cleanup.) Add the quartered onion to the chicken and marinade; toss gently to combine. Remove the chicken and onion from the marinade, and place on the pan, spreading everything evenly across it in a single layer. Scatter the parsley over the top and serve with chopped tomatoes, cucumbers, chickpeas, pita, tzatziki or garlic mayonnaise, hot sauce, olives, feta, rice... or whatever sounds tempting. February offers so many opportunities to overindulge: Super Bowl parties, Lunar New Year celebrations, over-the-top Mardi Gras feasts, and Valentine's Day sweets all conspire to make poor nutrition choices inevitable. Or is it just me? It's time to increase my healthy daily protein and vegetable intake. 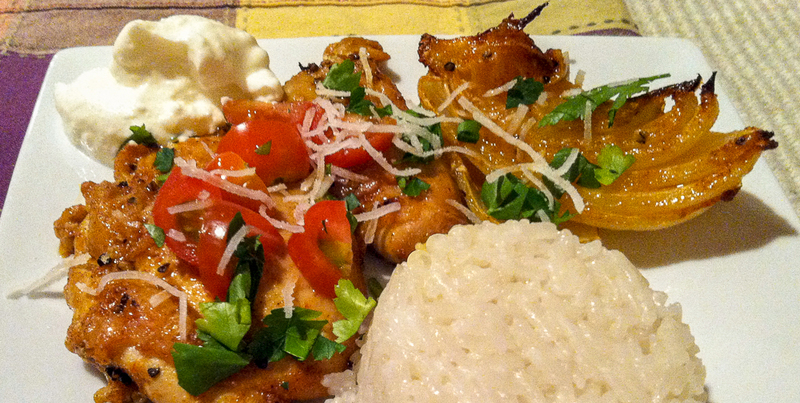 Time to choose dishes that are fresh, affordable, tasty and not overly complicated to prepare. 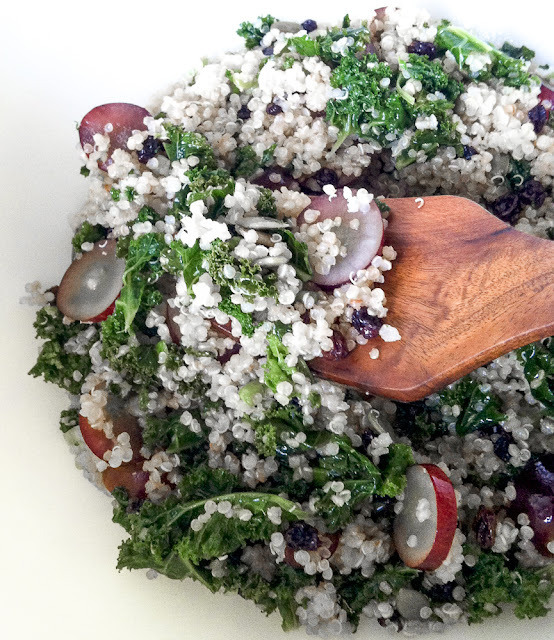 Kale plus quinoa just made the rotation with this delicious pilaf recipe. 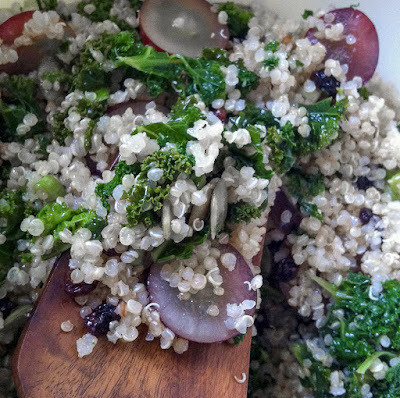 Kale + Quinoa = delicious, really? Absolutely, I wouldn't fool you. So here's one more recipe utilizing these ubiquitous ingredients. Food blogs, pinterest pages and restaurant menus feature tons of kale and quinoa dishes; some tasty, others not so much. My Recipe Index holds several kale recipes and a few that incorporate quinoa. None called for a combination of the two. Are kale and quinoa over-hyped food fads or essential super foods? Maybe both, but nutritious plus tasty makes a great combination... as long as it isn't repeated too often with the same ingredients. RL might would definitely not be thrilled with a daily dose of kale. Kale can lower cholesterol, diminish the risk for several cancers, provides antioxidant and and-inflammatory benefits and offers a host of vitamins and nutrients. Surprising factoids: one cup of kale and more vitamin C than a medium orange, is a good source of omega-3 and protein, and has more calcium than an equivalent quantity of milk. Google "kale" for additional data, it's interesting reading. Consumed for centuries by the Incas, quinoa has only become popular in our culture in this century. The Food and Agricultural Organization of the United Nations (FAO) has officially declared that the year 2013 be recognized as "The International Year of the Quinoa". Quinoa is very high in protein and, unlike most grains, it is a complete protein containing all of the essential amino acids we need for good health. Like kale, it provides antioxidant and anti-inflammatory benefits and a host of nutrients. Google "quinoa" for more information on this amazing gluten-free grain. Back to the recipe. Kale and Quinoa Pilaf is a quick and easy, one-pot wonder that takes less than 30 minutes to prep and cook. Its a terrific solution when you are pressed for time. Bonus! it doubles easily and holds well in the refrigerator. Enjoy the pilaf warm as an entree or side dish, or chill it to serve later as a room temperature salad. 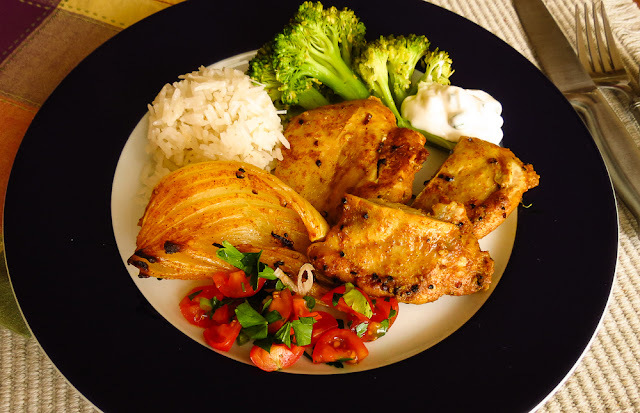 Add slivers of cooked chicken for the meat-lovers and it is a filling meal. Even the leftovers are versatile components to other dishes.This morning I added a cup of leftover pilaf (minus the grapes) to a frittata. Or use the pilaf to stuff peppers, chiles or tomatoes and roast in the oven. Or... Don't ignore kale and quinoa; this is a protein-packed duo. Bring the water to a boil in a covered pot. Add the quinoa and cover. Lower the heat and let simmer for 10 minutes. Top with the kale, cover and, without stirring, simmer another 5 minutes. Then turn off the heat and allow to steam for 5 more minutes. While the quinoa cooks, make the sauce. In a large serving bowl combine half of the lemon juice (reserving the other half), all of the lemon zest, scallions, oil, pine nuts, parsley, grapes (if using) and cheese. Check the pot 5 minutes after you add the kale; the water should be absorbed, the quinoa barely tender. If the quinoa still retains a hard white center, steam a while longer, adding more water as needed. When the quinoa and kale are done, fluff the pilaf and add to the serving bowl holding the sauce,. Toss to combine and season with salt and pepper. Taste and adjust seasoning, adding the remaining lemon juice if needed.